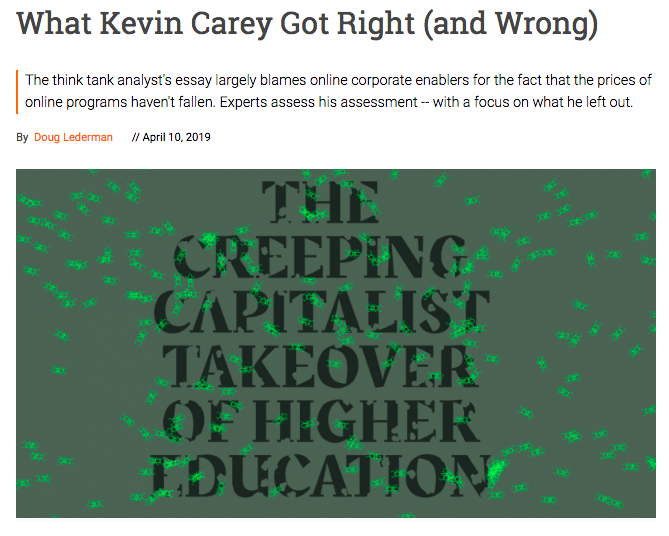 Kevin Carey’s controversial new article highlights troubling higher education trends that haven’t gotten much coverage from mainstream news outlets. Fifteen years ago, the expectation was that online education would help make college more affordable. But college tuition continues to rise and online learning features some disturbingly high-end offerings. 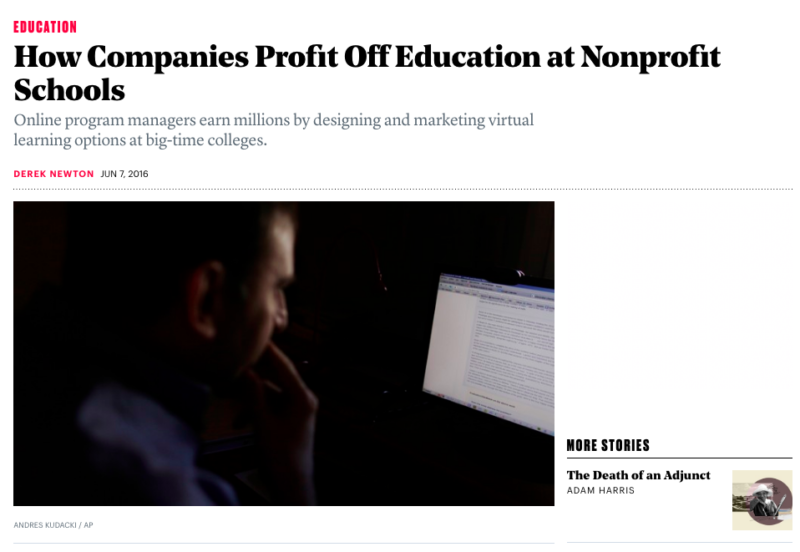 A new feature article from New America’s Kevin Carey tells us that one of the culprits may be the rise of all-but-invisible for-profit middlemen called online program managers (OPMs), who have convinced big-name universities to let them create and administer their online programs in exchange for a hefty share of the revenue. Published last week at HuffPost’s longform website, Highline, The Corporations Devouring American Colleges pulls multiple strands— college costs, online learning, deregulation, and inequality — into a compelling narrative. Published in the liberal-leaning HuffPost, the piece has no shortage of critics. A longtime think tank staffer, Carey plays a role that’s part reporter, part researcher, and part advocate, which some find objectionable. But there’s little disagreement that the development of online higher education is important and has gotten too little attention from mainstream reporters and outlets. In the following Q and A, which has been edited for clarity and length, Carey tells how he came to tell this story and why the mainstream press hasn’t spent enough time reporting stories about the business of higher education. Mainstream outlets need to acknowledge their biases and up their games, according to Carey. Sign up here for the week’s best education news and newsroom comings and goings. Carey’s HuffPost Highline article, which we named the best of the week, has generated a lot of discussion in recent days. Alexander Russo: What does online learning look like these days, in terms of engagement, rigor, and effectiveness? Has it really gotten all that good? Kevin Carey: The technology has matured to the point that bandwidth and processing speed aren’t issues for live interaction and streaming video anymore. A lot of the various underlying components — chat rooms, simulations, group annotation, etc., are inexpensive and work well together. And we have two decades of teachers and professors experimenting and figuring out what works and what doesn’t in a purely online or hybrid environment. Of course, none of that is a substitute for a well-designed curriculum or an inspired teacher. But that’s true of in-person higher education as well. AR: How and when did you decide that you had to revisit what had happened to online higher education since your book, The End of College: Creating the Future of Learning and the University of Everywhere? KC: I first heard entrepreneur John Katzman give a presentation on his company 2U back around 2010, well before I started writing my book. We had probably a half dozen conversations in the ensuing years, as he left 2U, started Noodle, and became a vocal critic of the OPM industry. But it wasn’t until the industry got much bigger, the OPM model spawned the for-profit to non-profit conversion trend, and the Trump administration kicked off its deregulatory agenda that it felt like there was enough context and importance to justify a long feature. OPMs also addressed a question that has been nagging me for a long time: why doesn’t technology ever make college less expensive? AR: What were the most challenging parts of reporting the story, and how did you address them? KC: It was tricky to nail down the causality of the policy decisions that were made back in 2010 and 2011. It was a while ago, there was a lot going on, and a lot of the most important conversations were just that — conversations, not official memorandums that someone could show me in 2019. So while people would say that they heard such-and-such was involved, I couldn’t prove it unless such-as-such agreed to talk, which they often wouldn’t. It’s also very difficult to get colleges to talk on the record about how much profit their programs make, and why. I had a hilarious back-and-forth with the communications director at one very expensive online MBA program, who first told me that their OPM-driven program was no more profitable than their executive MBA program (side note: these are also kind of a racket), and then in the next email said it was impossible to compare profit margins between their online and terrestrial programs. While trade publications have covered developments closely, this 2016 piece in The Atlantic is said to be one of the relatively few mainstream news stories about the rise of online program managers that have been produced. AR: The topic of online program management is extremely complex and super-wonky, but the end result is extremely readable. How did you do that? KC: For that, much of the credit goes to my editor, Rachel Morris. She was a great partner in shaping the piece. I was able to combine John Katzman’s personal narrative with the larger story of the federal government’s troubled relationship with for-profit colleges. It helped that Katzman’s original antagonist, Kaplan Inc., was present for every stage, first as a test prep company, then as an online for-profit college, and finally turning into a kind of OPM to itself. Betsy DeVos conveniently brought the story all the way to the present day. There’s a lot of greed and bad behavior in the story. That tends to get people’s attention and motivate them to engage with the wonky stuff. AR: Is there a healthy set of outlets, reporters, and editors focusing on the business of higher education? KC: The trade press has done a great job covering these issues. Doug Lederman and Lindsay McKenzie cover the beat really well at Inside Higher Ed, as does Goldie Blumenstyk at the Chronicle of Higher Education. Anyone who’s interested in this stuff should subscribe to Goldie’s newsletter. It hasn’t gotten much attention in the mainstream press, though, in part because OPMs are deliberately designed to not attract attention to themselves. AR: Why haven’t these developments gotten more attention from mainstream news outlets and reporters? KC: There’s a strong bias in elite media for the classic residential college experience at highly selective colleges, which isn’t that different than 100 years ago. If that’s your frame of reference for what college is, you may have a blind spot for where things really are and where they’re going. There’s also not much mainstream coverage of the business of higher education. If there’s a hot-button cultural issue to cover, national reporters are all over it. Ditto sports, elite admissions, and student loans. But in general, education reporters cover education and business reporters cover business. College is an education business, and a very complicated one at that, so media coverage kind of gets lost in the blind spot of that intersection. People see colleges as benign or even virtuous non-profit organizations providing a public service, not as an enormous multi-billion industry selling a valuable product in the free market. AR: Have you gotten any notable responses to the piece from OPMs, elite universities that work with them, and the main characters in the piece? KC: I’ve had a few employees from 2U contact me over the last couple of days. I don’t know that John agreed with all of my conclusions, but I hope he thinks it represented him fairly. I’ll let him speak to that if he wants to. AR: What’s your response to criticisms of the piece claiming, for example, that it’s unfair to blame OPMs for undergraduate tuition increases, and that nonprofit conversions remain so small in number? KC: I think final responsibility for college prices rests with colleges, and I hope readers come away from the piece with that in mind. OPMs do what we expect businesses to do – maximize profits. It’s colleges that have a higher social responsibility to keep higher education affordable. Non-profit conversions aren’t small in number if the numbers you’re looking at are students and federal tax dollars. Grand Canyon University, which I highlight, got more federal student loan money last year — $750 million – than any other college in the country. Purdue Global (nee Kaplan Online) has over 30,000 students. Ashford University has 36,000 students, and it got IRS approval to become non-profit two months ago. AR: Would you describe yourself as a journalist who’s produced a piece of longform journalism or an analyst who’s produced a piece of reported opinion or advocacy? How (if at all) is this piece different from others you’ve written for the New York Times? KC: I’ve never described myself as a journalist. When I write for different publications, I follow their editorial standards and practices. The Upshot publishes a kind of policy- and data-oriented news analysis, which is why some of the other contributors there are college professors who write from their field of expertise. I would describe this piece as longform narrative with a strong point of view. AR: Many of the graduate students who earn their degrees through OPM-run online degree programs like the ones at USC and Concordia University are K-12 teachers. Why is that? KC: Many teachers have to get masters degrees to maximize their compensation on the salary schedule, and it usually doesn’t matter what university does the teaching, as long as it’s accredited. Online education can be a great option if you’re working during the day and taking care of your kids in the evening, as many teachers are. So that combination of scale and built-in demand creates a lot of profit opportunity for whomever is good at marketing. Sometimes the appeal might be a famous brand, like USC, or the kind of boiler-room sales tactics that the Department of Justice accused Concordia — or, more accurately, the OPM that was pretty much running Concordia’s masters program — of engaging in. AR: What are the implications or parallels for reporters and news outlets covering K12 online learning, if any? KC: I have a lot of concerns and suspicions about fully online K12 programs run or facilitated by for-profit companies, put it that way. AR: Are there K-12 equivalents to OPMs, or for-profit companies wrapping themselves in nonprofit designations? KC: That question sounds like the premise for a good article someone should write!